Meeting at the Masonic Hall, Albert Road, Clevedon BS21 7RN. 18.45 0n the first Thursday, February, April, June and October (Installation 18.30). The Lodge has 31 subscribing members. February 2nd 2012 - The lecture on the degree of Mark Master Mason was presented in an excellent manner by Phil Voisey, Richard Farmer, who is now fully recovered from his recent illness, Matt Westley and Peter Harris. The photo shows the current team at Eldon Lodge. From left to right - Junior Warden Philip DuCamp, Master Sandy Sandford and Senior Warden Chris Haliburton. It was a wonderful evening at the Eldon Lodge Installation, The Deputy PGM, Ray Guthrie was in attendance to witness the outgoing Master Peter Purchase install his successor with great dignity. The new Master Peter Harris took over well and invested his officers. W.Bro Jim Fletcher was elected an honorary member of the Lodge in recognition of the tremendous service that he has given too the Lodge over many years. The meeting was followed by the usual excellent Festive Board where good Mark Fellowship was enjoyed. 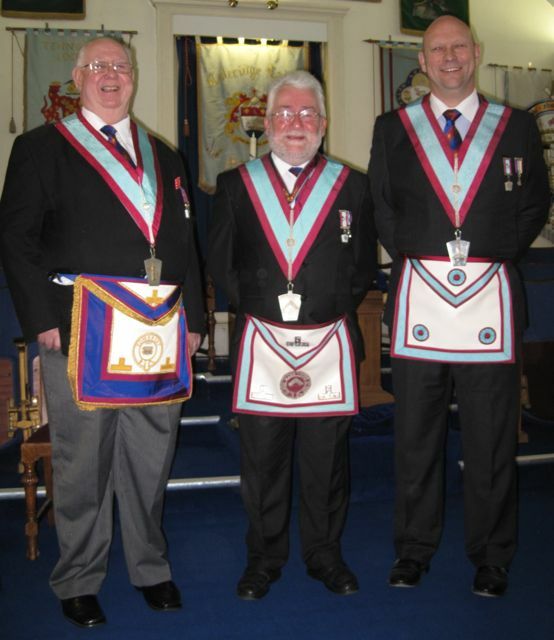 In the photo left to right, Sandy Sandford SW, new Master Peter Harris and Junior Warden Chris Haliburton. 24th February 2015 - Hallam and Eldon Mark Lodges join forces to attract new candidates.